Journey of the Goddess: Circle of Resonance- Enrollment now open! Plan to begin 2018 with a re-commitment to self-love, care, and compassion. Plan on refilling your well. Save the date for my annual winter yoga retreat: January 12-14, 2018 at the Christine Center in Willard, Wisconsin. 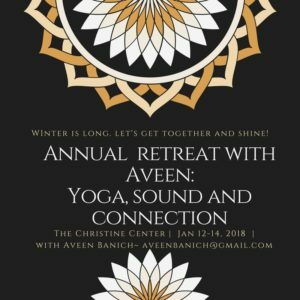 Make plans to join me for a weekend of yoga, visioning for 2018, rest, healthy, delicious food and connection. After my recent move to Colorado, I am more excited than ever to return to one of my favorite places in Wisconsin and meet up with old and new friends! I see a beautiful group of souls gathering for this retreat. Cost is $175 plus food and lodging. Contact Aveen at aveenbanich@gmail.com with any questions. “Adventure is worthwhile” (Aesop) and the journey is way more fun with good company. 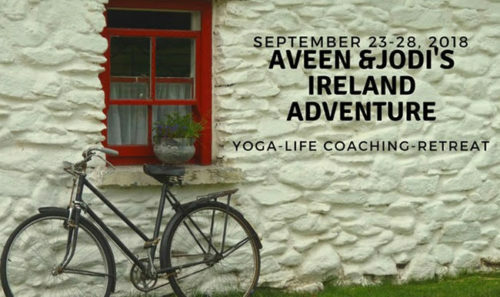 Join Aveen Banich and Jodi Ritsch as we embark on a great adventure to Ireland September 23-28, 2018. We are so excited for this adventure and we hope you can join in on the fun! Together we will connect with the celtic spirit, explore areas of great natural beauty, try new and wonderful food and drink, enjoy great music, practice celtic inspired yoga and most of all, have a grand adventure. This amazing week away will be a wonderful opportunity to unplug and press pause on your everyday life. Traveling to new lands with great company expands us and our vision. Laugh, eat, hike, connect, do a little yoga, make new friends and reconnect with your joy! Ireland is a special place for Aveen. Her parents hail from the Emerald Isle and she spent many childhood days falling in love with the land and it’s people each summer. Ireland feels like home and the perfect place to take a leap into the world of international retreats. We enlisted the help of seasoned traveler and international retreat leader, Amy Annis to help find the perfect location for our group. The Manor House will be our home away from home. It is nestled in one of the prettiest places in Ireland. Beautiful historic manor home set in a private secluded 68 acre walled estate near Killarney on the Ring of Kerry. Feel good in your body and centered in your spirit with daily Celtic inspired yoga classes with Aveen. Numerous guided hikes and walks taking in the beautiful Gap of Dunloe, Killarney National Park and more. Slow food tour around the Dingle Peninsula: A day of laughs and intrigue, richest inspiration and delicious tastings. Irish cooking day with local chef and then enjoy an evening of traditional Irish music, even learn some irish dances. Throughout the trip, Jodi and Aveen will hold space and create opportunities to amplify your joy and turn up your light so that you return to your life at home enriched and inspired. Two meals will be covered each day with most lunches on your own. Ready to join us on the Irish adventure? Total Cost for this awesome adventure is $3,195 – double occupancy. Your deposit of $750 is necessary to reserve your spot. As spaces are extremely limited, please submit your deposit as soon as possible. This deposit is applied to your total trip cost. Additional $750 – single occupancy supplement is due with your deposit (should you wish to reserve a room to yourself). Lunches so you are able to explore local eateries. Additional travel days after departure Saturday September 29, 2018. Souvenirs, snacks, shopping purchases, personal phone calls, and alcoholic beverages. Your international roundtrip flight to Shannon SNN(please arrive by 2:00pm on Sunday September 23, 2018), travel insurance, and any other insurance you need. Any cancellation received in writing from December 1st to March 31, 2018 will result in a total loss of the $750 USD deposit. Any cancellation received in writing between April 1 to June 1, 2018 will result in a loss of 50% of the trip price. Any cancellation made between June 2 and the trip departure will result in a total loss of funds. We reserve the right to cancel the trip if it is not meeting the trip minimum (if we do so your funds will be refunded). Trip cancellation insurance is always recommended when making travel plans. Amy Annis is able to arrange travel insurance as well as additional travel plans for extra days on the Emerald Isle. The Goddess archetype is revered throughout the world and in all traditions. By consciously connecting with this energy, we heal ourselves and our world. Kuan Yin is the archetypal Goddess of compassion. In this workshop, Aveen will lead you on a journey of compassion for self and the world thru myth, mantra, movement, meditation and song. Give yourself the gift of a sacred pause as the wheel of the year turns to winter. This workshop blends a delicious yin yoga practice with breath-work, guided meditation and a gemstone alchemy bowl sound bath. Come explore yogic teachings to bring harmony and balance to the body, mind and heart. How can we begin the new year from a place of peace and balance? Soothe is an evening of sacred sound, gentle yoga, energy work and connection. This workshop will introduce ideas of coherence and experiences which foster intrinsic wellbeing of the nervous system. Participants will leave feeling calm and nourished. All are welcome. No experience neccesary. Refill your Well: 5th annual winter retreat weekend! 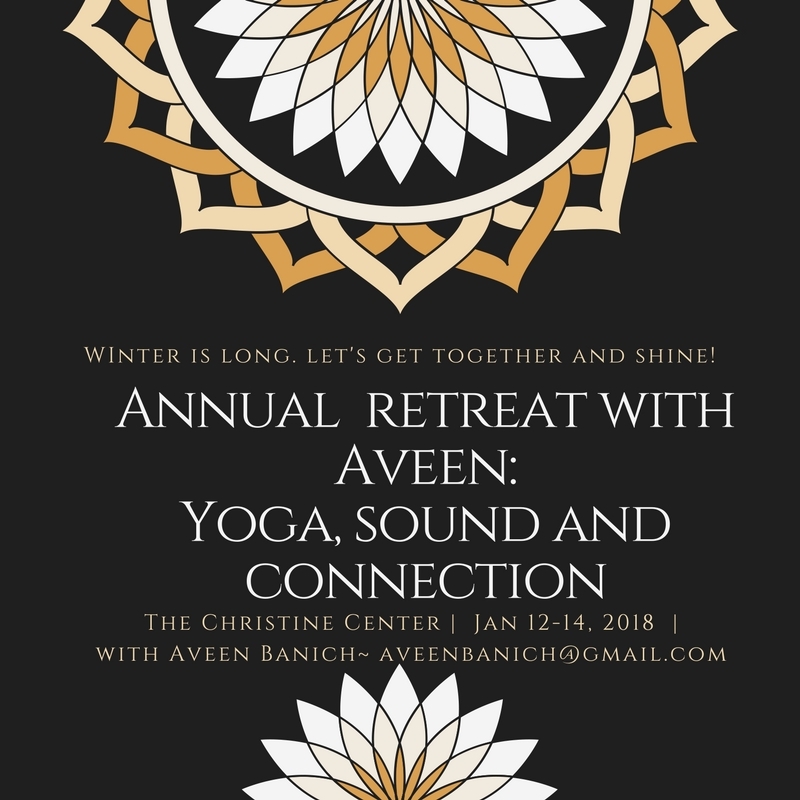 Join Aveen for her 5th annual winter retreat at the Christine Center. Plan to begin 2019 with a re-committment to self-love, care and compassion. Come to refill your well, attune to your heart and find resonance both with yourself and the amazing wisdom circle that will gather with you. This weekend will consist of gentle yoga, chant and sacred sound, visioning for 2019, rest, delicious nourishing food and sacred connection. Yoga styles will include gentle vinyasa flow, yin and restorative practices. You will leave the weekend feeling rested, refreshed and renewed. Filling our cups as teachers and healers is so important. We know this. And yet, it is also usually the first thing to go when we become busy and life gets in the way. This training teaches about the polyvagal theory, heart coherence and how as teachers, we can only take our students as far as we have gone ourselves. So much research is being discovered about the importance of safety in the body as a means to reach our highest states of potential. We must feel safe in order to access our creativity, inspiration and vitality. The good news is that we can learn how to regulate our nervous system daily in order to return to flow again and again. We can then begin to live and teach from there. This training will focus on practices that have been shown to soothe us. We will work with pranayama, chant, sacred sound, energy medicine, and simple but beautiful ways to nourish the senses. Once we are soothed and nourished as teachers, we can translate these practices to create spaces and classes that soothe and nourish our students. Once we are soothed, we can offer so much more to those we love, serve and teach. All participants who choose to, will also be attuned to Reiki level one during this weekend training. Aveen’s work as a transformational mentor and guide helps amplify your own knowing so that you may trust those whispers and step confidently into your own truths and divinity. Reach out to Aveen today to fulfill your destiny.